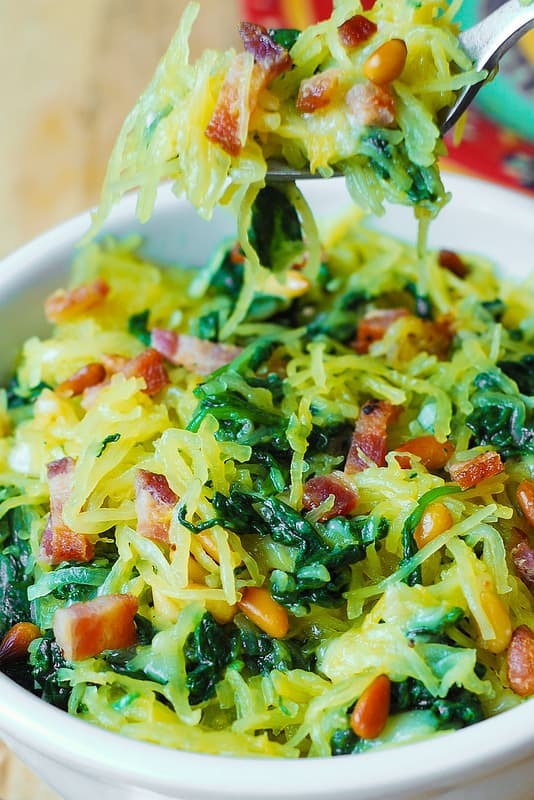 Healthy, gluten free, and delicious comes together in this oven-roasted Parmesan Spaghetti Squash with Spinach, Bacon, and Pine Nuts. The combination of vegetables with nuts and bacon is amazing! And, the cooking method is simple – just combine everything together. First, roast the spaghetti squash in the oven. Here is an easy tutorial showing you how to cook spaghetti squash in the oven. Then, quickly saute spinach with minced garlic in olive oil. Next, you pretty much combine all the ingredients together. 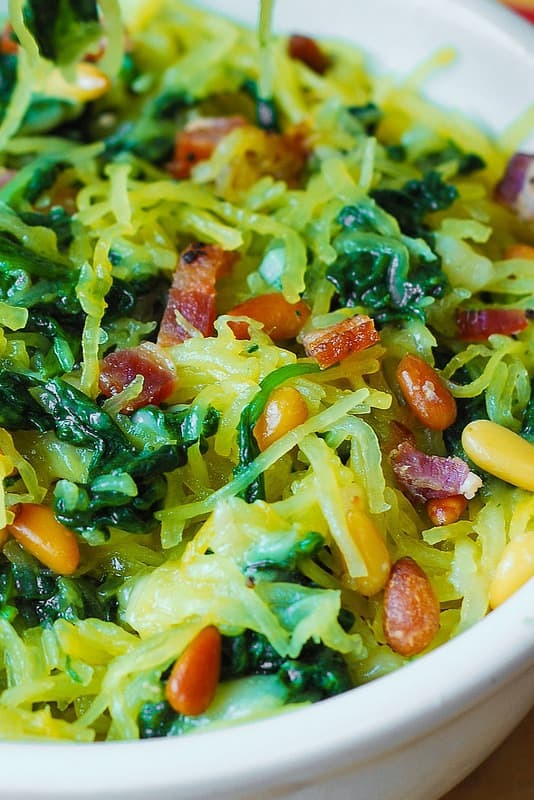 In the same skillet where you cooked spinach, add cooked spaghetti squash and finely chopped cooked bacon. Add freshly shredded Parmesan cheese and stir everything on gentle heat until all the ingredients reheat and the cheese melts. In the end, all you have to do is taste your spaghetti squash dish and season it with salt and pepper. And, don’t forget to top it with lightly toasted pine nuts for crunch! Roast spaghetti squash in advance. Roasting spaghetti squash is easy, but it does take time. You also need spaghetti squash to cool before handling it. It’s best to roast spaghetti squash in advance, same day or even the day before. Use freshly shredded Parmesan cheese. I prefer to buy a block of Parmesan cheese and shred it myself right before using it. Toast pine nuts. Toasted pine nuts have an amazing flavor and look beautiful! You’ll love the delicious vegetables combined with nuts and bacon in this simple, healthy, wholesome recipe! 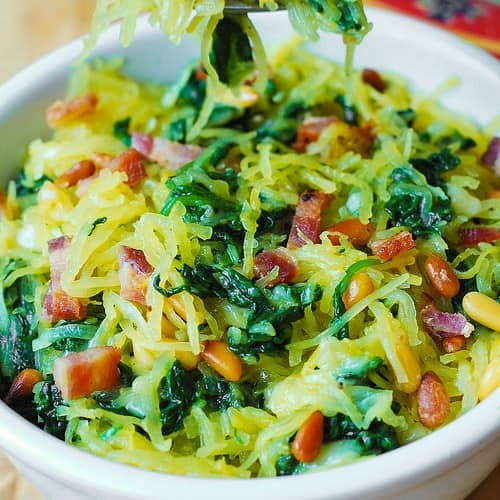 Healthy, gluten free, easy-to-make dinner: Parmesan Spaghetti Squash with Spinach, Bacon, and Pine Nuts. Vegetables and nuts together with bacon - it's a wonderful combination! Cut the squash in 2 halves, scrape out the seeds and the fiber out of each half. Spray 2 tablespoons of olive oil over the cut sides of the squash. Spray the baking sheet with oil and place the squash on the baking sheet cut side down. Bake for about 30-40 minutes. Remove it from the oven when it's cooked through and soft, and let it cool. Flip the squash so that cut side faces up – that will speed up the cooling. After squash cools, scrape squash with a fork to remove flesh in long strands and transfer to a bowl. Heat 1 tablespoon olive oil in a large skillet on medium-high heat. Add minced garlic and fresh spinach and saute for about 2 minutes, stirring, on medium heat, uncovered until spinach wilts. Season with salt. 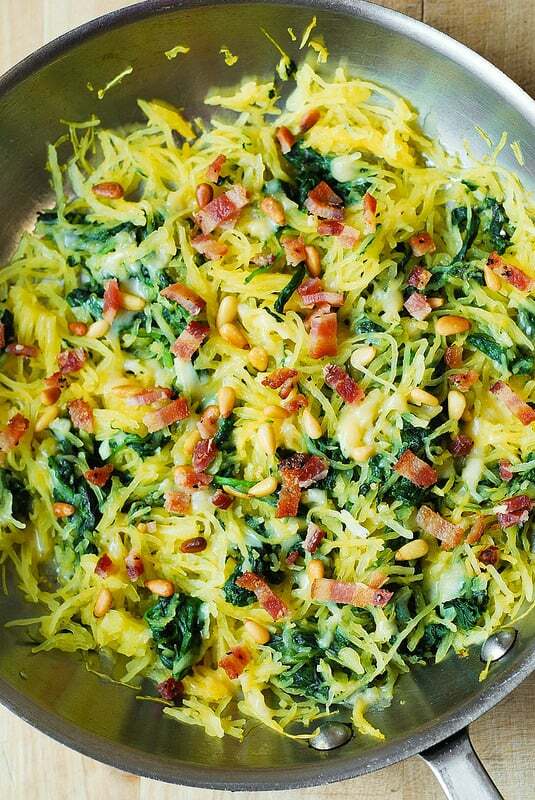 Add spaghetti squash to the skillet with spinach, add finely chopped cooked bacon and mix to combine, on low heat. Add freshly shredded Parmesan cheese to the skillet and stir on low heat to melt the cheese. Add salt and pepper, to taste. Top with toasted pine nuts. I am so glad you liked this recipe! Adding mushrooms sounds delicious! There is a print button in the recipe card right underneath the photo (in the recipe card) – if you would like to print this recipe!